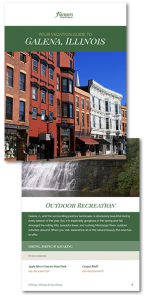 If you are planning a visit to the beautifully restored historic Main Street of Galena, IL and the nearby area, then you should download our free, ultimate guide to planning an Illinois vacation! Galena, IL has truly become a vacation destination for visitors from as close as Des Moines, Chicago, and from around the globe! Recommendations for the Best Restaurants in the Area!